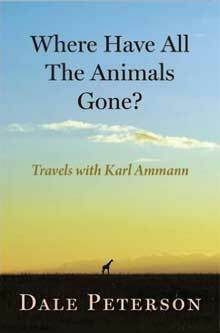 This book is the narrative of my recent travels in Asia and Africa (Kenya, Uganda, Gabon, Central African Republic, Congo, and Namibia) with the photojournalist and wildlife photographer Karl Ammann. It is an eccentric and tragicomic look at our vanishing wild world, as well as an idiosyncratic and personal portrait of the photographer Ammann. In fact, Karl and I began these travels almost fifteen years ago, now, when we decided to produce the book Eating Apes (I wrote the text, he took the photos), which is about the commercial trade in exotic wild animal meats in Central Africa and how it is threatening the lives of Africa's great apes: chimpanzees, bonobos, and gorillas. We traveled around Central Africa and met ape hunters, traders, marketers, and consumers, while having our usual good or at least interesting time. Guests of Gabon's President Bonbo one minute, visiting Cameroon's gorilla hunters the next, stuck in a two-day traffic jam after that. Producing a coffee-table style book about elephants took Karl and me back to Africa—and Asia—about three years later; and the second part of this narrative describes our pleasures, frustrations, and adventures along the way. Off to Burma (Myanmar), for instance, to do a lot of strange things involving prostitutes and dead animals in the Golden Triangle before, at last, finding the Burmese timber elephants. Then back to Africa to see and photograph savanna elephants in East Africa and over to the Dzanga-Sanga bai in Central African Republic for forest elephants. The book's third part relays a giraffe tour that takes us first into the Democratic Republic of the Congo (for okapis: giraffes' closest relatives) and then around and about in Kenya and finally off the deserts of Namibia.